I did not grow up with chicken and dumplings. I’d always lumped the dish in with chicken-fried steak and biscuits and gravy; milk gravy makes my stomach turn. 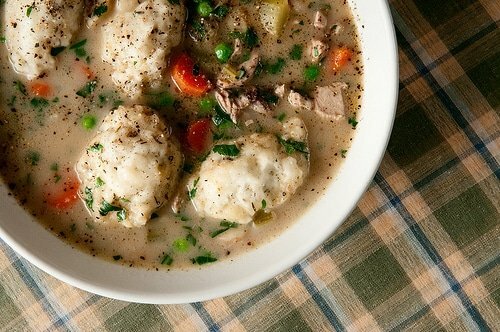 For decades, I’d just ignorantly tossed chicken and dumplings into the same culinary trashbin. Then, one day, my friend Elise and I decided to remake her recipe for chicken and dumplings so we could get a better photo. One of the side benefits to this is that I get to eat the dish when Elise finishes photographing it. I was a little put off by the gigantic dumplings floating in the broth, but I figured it would make a decent enough lunch. I took a bite. Wow. So that was what I’d been missing! Big these dumplings may be, but they were as light as air and nicely coated with a silky chicken broth. The broth itself was the loveliest chicken soup I’d eaten in a long, long time. This wasn’t a Southern horror, like pickled pig’s feet. This was a wonderful dish, homey and layered at the same time. No wonder it was a classic. Chastened, I decided to adapt Elise’s recipe for wild game. Pheasant is the natural analog for the dish, but I’ve made it with ruffed grouse, too. Partridge, wild turkey, quail or even squirrel or rabbit would work well here, too. 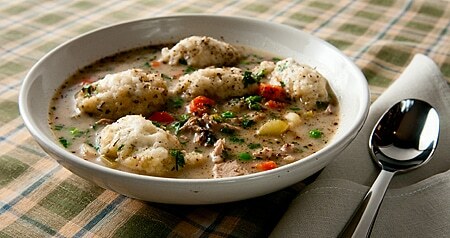 Squirrel and dumplings is actually a classic recipe in parts of the South. This is not a quick and easy dish. It is a dish of love, of time and of patience. First you simmer the grouse to make a stock, then you pull the meat from the bones to return to the soup later. You strain the stock and rebuild the soup with what is essentially a French veloute, a combination of a flour-and-water roux and the hot stock. New veggies go in, as well as the pulled meat. You finish it off with the dumplings, which really do need the cake flour to be as light as possible. I now make pheasant and dumplings with some frequency, and I’ve even learned to love wild game versions of chicken fried steak. But I still hate milk gravy. 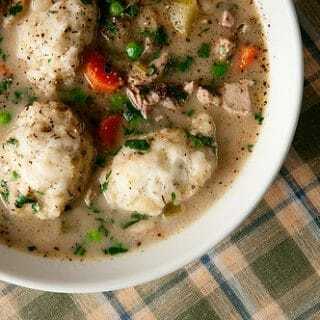 In many parts of the country, chicken and dumplings is the ultimate comfort food. Making it with wild birds is only a matter of increasing the cooking time. Wild birds work for a living, so some can take hours before the meat falls off the bone. But have faith, it will, in time. If you save the giblets, use the heart, gizzard and neck in the broth; don't use the liver, as it will make the broth cloudy and give it a weird taste. If you are wondering about the cake flour in the dumplings, yeah, it matters. It makes the dumplings much lighter and fluffier. If you can't find it, you can use all-purpose. Do not use bread flour. Start with the broth. Toss all the broth ingredients into a large stockpot, cover with at least 2 quarts of water (you can save any extra broth for later) and bring to a strong simmer, about 200 degrees if you're checking. Drop the heat to below a simmer -- look for lots of steaming, and just a couple bubbles on the surface -- and let everything cook 20 minutes. Fish out the pheasant and remove the breast meat. Set it aside in the refrigerator and return the rest of the pheasant to the pot. Cook for as long as it takes for the meat to want to fall off the leg bones, from 45 minutes for a pen-raised bird to 2 1/2 hours for an old rooster. When the pheasant is done, gently remove it from the broth and let it cool enough to handle. Pick off all the meat from the bones, being sure to remove all those nasty tendons in the pheasant's legs. Put the meat in the bowl with the breast meat. Take the breast meat and shred it, then return everything to the bowl. Strain the broth. Using a spider skimmer or slotted spoon, remove as many big pieces of vegetable as you can from the broth. Put a fine-meshed strainer that has a paper towel set inside it over a large bowl or pot. Pour the stock through this. You might need to change paper towels halfway through if it gets too gunked up. Pour the broth into a pot and set it on low heat. To make the stew, heat the butter in a large pot or Dutch oven set over medium-high heat. Saute the carrot, celery and parsnip for 3-4 minutes, stirring often. You don't want the veggies to brown. Add the flour and stir to combine. Everything in the pot will seize up, but that's OK. Drop the heat to medium-low and cook, stirring often, until the flour turns the color of coffee-with-cream. Add the vermouth and stir well, then start adding the broth 1 cup at a time, stirring constantly, until it looks silky. It should take 6-8 cups. Add the pheasant meat and bring this to a simmer. Cook gently until the veggies are soft, about 30 minutes. Meanwhile, make the dumpling dough. Mix all the dry ingredients together, then add the melted butter and milk. Stir just to combine -- do not overwork the dough. Drop the dough by the teaspoonful into the simmering stew. When all the dough is in, cover the pot and cook over low heat for 15 minutes. It is very important that the stew not boil during this time, or your dumplings will get tough. After 15 minutes are up, uncover the pot and add the peas and parsley, stir gently to combine. Let this cook 1-2 minutes, then turn off the heat. Add salt and black pepper to taste, then the heavy cream. Serve at once. Hank, I just got back from Kansas with a pile of birds and I really want to make this dish. I haven’t eaten chicken and dumplings in a long time, but I’ll try to make it gluten and lactose free since my wife has allergies to both. Side note though, I read your above comments about milk gravy and chicken fried steak and laughed. My great-grandmother in rural southwest Georgia used to make a dish with cubed venison steak dipped in flour and fried until browned. Then she would take the venison out of the pan and add some flour and chopped onion to the skillet until the flour browned. Once the flour browned, she would add water to the flour and make a gravy, adding the venison steak back to the gravy to simmer until the gravy was thick and the steak was ready to fall apart. My question for you is, what would you call this dish? She never called it anything but fried steak. I still make it, but can’t come close to her version. Did this recipe with some old wild Turkey legs I found in the freezer, turned out incredible. The legs were silky and full of flavour by the end.